Woolworths is to hold a store closure sale in all its 815 outlets from Thursday amid growing concern that a buyer will not be found for the firm. Administrator Deloitte said that if no offers for Woolworths were forthcoming, "it is possible that some stores may close before the end of December". It added that it would consult with the retailer's 30,000 staff over support available in the event of redundancies. Separate talks are continuing over the sale of Woolworths' store leases. It is thought that Sainsbury's, Asda, Tesco, the Co-op and discount chain Poundland are still interested in picking up some of the retailer's prime stores. "We continue to make every effort to convert interest in the Woolworths assets into firm offers," said Deloitte partner Neville Kahn. "While we are still seeking bids from interested parties, Christmas is clearly the busiest time of the year for retailers and it is prudent to do all we can to sell existing stock. "By moving to a store closing sale and further discounting the stock, we are maximising the sales potential that this period offers." Deloitte had held talks to sell the business as a going concern to potential buyers including former Woolworths chief executive Sir Geoff Mulcahy and Dragon's Den star Theo Paphitis, but no deals could be reached. 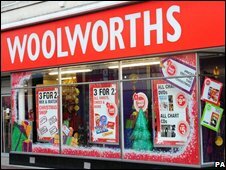 BBC business editor Robert Peston said it was telling that Woolworths stores may now start to close by the end of this month. "This isn't the end for Woolworths, but it is a black day, and many people will see it as the beginning of the end." Woolworths went into administration on 26 November with £385m of debt. The firm's music, DVD and games distribution subsidiary, Entertainment UK, is also in administration. Last week, rival retailer Zavvi, which is a customer of Entertainment UK, said the situation was causing shortages of certain products in its stores. Media publishing business 2Entertain, in which Woolworths owns a 40% stake is not in administration. The other 60% of this business is owned by BBC Worldwide, the BBC's commercial division. Woolworths had been due to celebrate its 100th anniversary next year. Its first UK store opened in Liverpool in 1909.